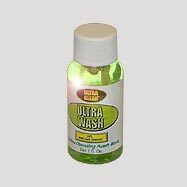 Ultra Wash Toxin-Cleansing Mouthwash helps successfully pass the saliva test. It makes sure that any traces of unhealthy toxins are not detected in saliva. Ultra Wash Toxin-Cleansing Mouthwash promises freeing mouth of any toxins for maximum of one hour. Toxins such as marijuana, nicotine, THC, or alcohol could not be found in the saliva after using this product. It's a very reliable product, at the same time is very affordable. Make use of it, merely 10 mins ahead of preferred time of cleansing. The technique is very easy, simply agitate, swoosh and spit. Ultra Wash Toxin-Cleansing Mouthwash is the sole answer, in case of chance saliva testing. For extensively reducing the toxin level in the body, previous to individual deadline, it is highly recommended to take Pre-Tox Master Concentrated Capsules or Master Tea. Premium Detox seven days comprehensive cleansing program is suggested for people requiring complete purification of the body. The constituent of this product comprises of Glycerin, Potassium Chloride, Water, Witch Hazel, Magnesium Sulfate, Boron Citrate, Sodium Benzoate, Lithium Sulfate, Potassium Sorbate and Aloe Vera. 1. Briskly agitate the bottle. 2. Take � mouthwash of 1 oz. in the mouth and hold for 2 to 3 mins. Cough away the rest of the mouthwash. Strictly, do not swallow this product. 3. Follow the above step with the rest of mouthwash for at least 2 mins, merely 10 mins ahead of the individual's deadline. 1. An individual needs to take care, not to drink or eat anything, while using Ultra Wash Toxin-Cleansing Mouthwash. 2. Keep away from chewing tobacco or smoking, while using this product. 3. Also, keep away from consuming any unwanted toxins 24 to 48 hrs ahead of the test.